FT Sportster: first build, first plane. A little over a week ago, after spending the last month consuming the vast majority of Flite Test's YouTube videos (excluding multi-rotor content, as my interest lies in fixed wing) I ordered the crafty kit and an FT Sportster speed build kit along with the optional Power Pack C, and additional pair of 9x6 props. It was delivered on Saturday, and today I spent the afternoon burning my fingers, making various mistakes, cursing aloud, and having a blast. I'm at a stopping point, as I haven't received my 3S 2200mah Turnigy lipo's from Amazon yet, and can't center my servos. I tried to dig around and find the little 1S batteries for my tiny heli, but to no avail. I understand I can only use a 1S battery on the servo gizmo that came in the crafty kit, or burn it out. I'm using a Turnigy 9X-v2 radio with the 8ch receiver it came with from when I used to fly (crash) my HK-450GT helicopter. I've never flown a plane before, much less configured it for that, but I'm sure there are videos and how-to's about it. I believe Flite Test did a video on it, and it was Josh Scott's "first radio". Mine too. Sounds great! For the servo centerer you don't want to put to many volts and such through a servo, so yes. Now, if you're willing to trust factory settings, which are often close enough, you can just play it in through a recover on a stick channel (channel on a stick like elev. Or ail. Or rud.) Without trim, then put servo arms on. not interested in multi-rotors... for now!! lol only joking. I was the same way tho. I went through almost every FT plane design with little interest in multis, then bought a mini-quad... my entire life changed! haha. The build looks great man, awesome job! I've never flown a plane before, much less configured it for that, but I'm sure there are videos and how-to's about it. I believe Flite Test did a video on it, and it was Josh Scott's "first radio". Mine too. In a video recently Josh showed how to use a 2s or 3s battery on to power the servo centered. It may have been in the mini Mustang build. Very nice looking build there Sam! Waiting for parts is part of the game. I hear you about fixed wing. I eventually learned to fly multi-rotor but haven't touched them in a year. Doubt I will. Just a fixed wing kinda guy.. Have fun! I actually have Clearview, I used it a LOT when I was practicing helicopter flight. Just pulled out my old trainer controller, and surprisingly had a fairly easy time flying 3 and 4 channel planes, once I got the controller calibrated and set up correctly. Also, finally did get my servo's centered using the included device, and finished the build yesterday afternoon. 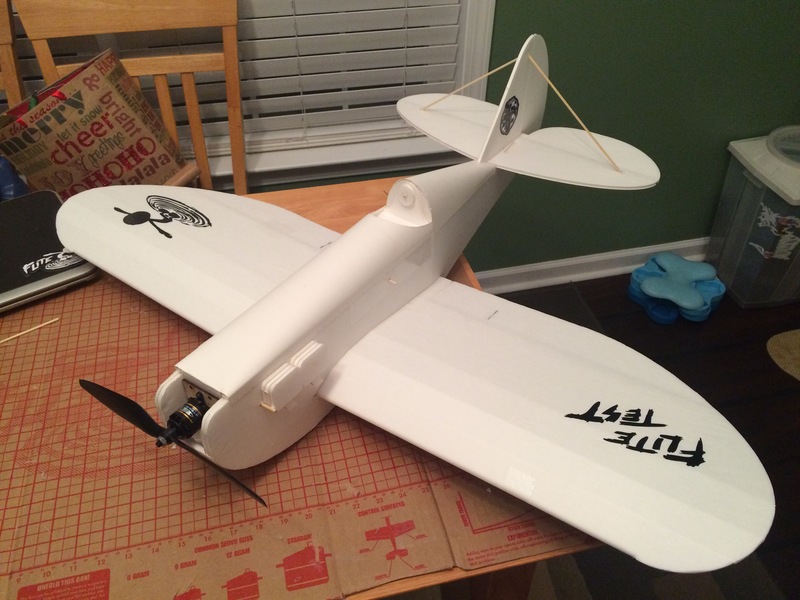 However, when I plugged in the 3S battery, turned on my transmitter (which had everything zero'd out - no trim, no endpoints, completely center) the servos moved a little bit, and I had to add more trim than I would have liked to every one of them to get the ailerons, rudder and elevators level. Now I'm wishing I hadn't used Josh's method of bending the wire instead of using the servo arm screw things that came with the speed build kit. 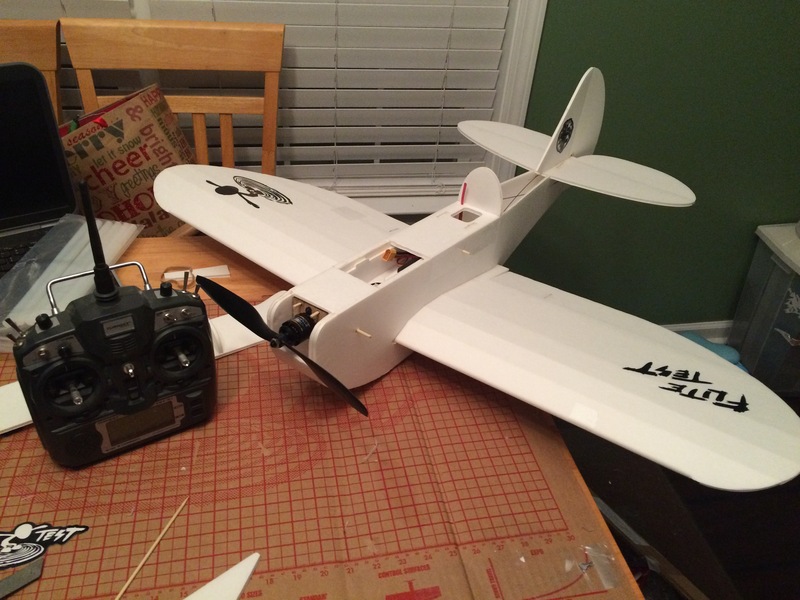 I could replace the rods on the ailerons, but I don't have enough wire for the elevators and rudder. I think it will work, as the trim isn't maxed out or anything, and all the control surfaces still meet the throw gage. Center of gravity seems to be as suggested, and as far as I can tell, I've done what I can to make my very first flight as successful as possible.